Vinyl flooring is by no means a new science, but what keeps it at the forefront in the flooring sector is the rapid rate at which technological advances continue to take place. Over the past few years, Interlocking Vinyl Flooring has made great strides and continues to leave specifiers and designers in awe of the new solutions being brought into the market. The latest trend in Interlocking Vinyl Flooring is the shift from solid vinyl formats towards composite or “rigid core” planks. The boards are more stable, lighter and can be installed in direct sunlight. Rigid core planks can also be installed in areas of 30m by 30m without the need for expansion joints (in ideal circumstances this can be exceeded) and are happy to operate in temperatures from 3°C to 50°C. Aesthetically, this allows for seamless installations and also avoids the need for installing profiles between rooms and passages, for example. One of the spin-off benefits of rigid boards is that they are much more forgiving in terms of screed preparation. Telegraphing from rough screeds or when installing over old tiled surfaces is now a thing of the past. During the production process, sound mitigating backers installed directly onto the planks eliminate the need for underlays. Installation time is faster because of the introduction of “Top Lock” systems in rigid core planks that also ensure enhanced joint strength. Traviata has introduced two brand new ranges in line with the latest advances in the industry, with each range offering eight interesting new patterns. 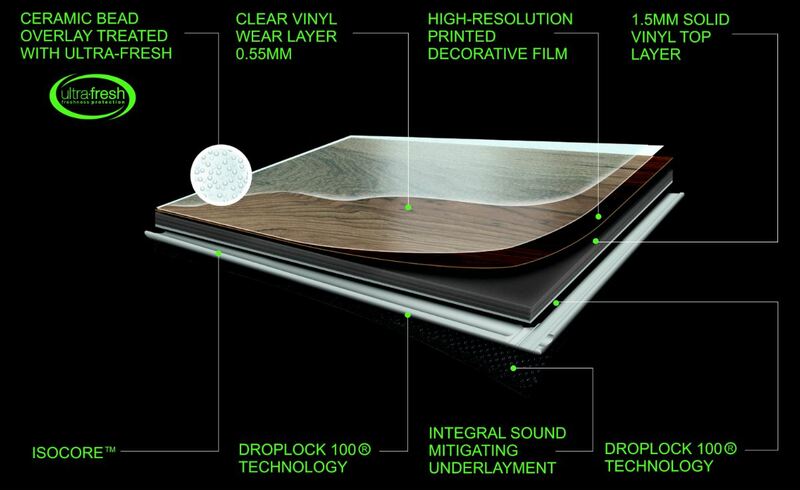 Firm-Fit is a 4mm Rigid Core Board with a 0,3mm wear layer and a cork sound reducing backer. This range is ideal for all residential and light commercial installations. IsoCore – Classic is a 6,5mm board that uses the well-established IsoCore method. It has a 0,5mm wear layer and a factory applied IXPE foam backer. Both transferred and drum noise are greatly reduced and it has the added advantages of being softer and warmer underfoot. IsoCore Classic is ideal for use in all commercial, hospitality, retail, medical and residential applications. The well-known IsoCore XL range remains unchanged with its larger format boards being well suited to bigger commercial projects.